For Arlyne Rhode archery has been a lifetime pursuit and keeps her fit and focused. She won nine consecutive Minnesota National Field Archery Association competitions in the 1960s and 1970s. In 1978 she won the Women’s Professional Flight champion crown and became a record-holder as the Women’s Footbow Flight World Record with a distance shot of 1,113 yards, 2 feet, six inches – a record that still stands in the Guinness Book of World Records. Rhode has continued to inspire athletes of every age with her record breaking performances. As the 2008 Arizona Senior Olympic Champion, Rhode stunned the world when she qualified for the 2009 National Senior Olympics. In 2011, continued her winning ways by taking first place in the Huntsman World Senior Games in St. George, Utah in her age division. 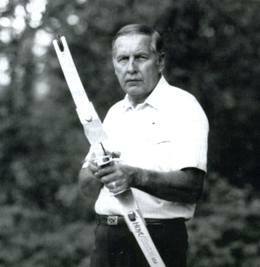 Bob’s career in archery began with the Ben Pearson Archery Co. Later he worked with American Archery, Bear Archery, P.S.E., and Hoyt USA where he retired as their senior Vice President. Bob was one of the founders of the Professional Archers Association, and was a lifetime member of the National Archery Association and the National Field archery Association. He was also known as an experienced tournament director and officiated at the first indoor professional tournament held at Cobo Hall in Detroit.